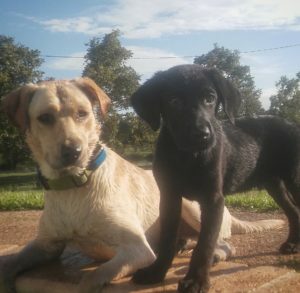 Your new Lab puppy is already in Hunters Creek Retrievers “Top Dog Puppy Head Start Training Program”, which includes hand signals, verbal and whistle commands for Come, Heel, Sit, and Stay as well as Crate Training which is the first step in housebreaking. 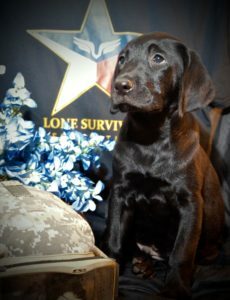 Hunters Creek Labradors are bred with a gentle temperament perfect as child’s canine companion without sacrificing an outstanding pedigree for Hunting, Competition, as a Field Trial Champion, Service or Therapy Dog. Hunters Creek Retrievers provides a full two-year Health Guarantee on Hips & Eyes. Additional training is available including personalized in-home dog training for your entire family. This puppy is being auction off at the 2016 Houston Gala live auction on September 24, 2016. Click here for more information and to purchase tickets. **Serious bidders: If you are unable to attend the gala but would like to bid on this live auction item, please email vanessa@lonesurvivorfoundation.org by Wednesday, September 21st and we will be happy to facilitate your bid by proxy. next post: Announcement: Lone Survivor Foundation partners with Five Finger Death Punch for the 2016 Fall U.S. Tour!